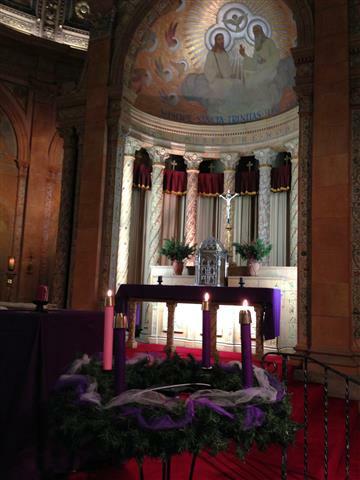 Sunday, December 24 ~ Christmas Eve Mass of the Nativity at 10:00 p.m., preceded by choral preludes at 9:30 p.m.
Monday, December 25 ~ Christmas Day Mass of the Nativity at 10:00 a.m.
Sunday, December 24, is both the Fourth Sunday of Advent and Christmas Eve. Consequently, there will be two services. Attendance at the 10am morning Mass satisfies your Sunday obligation. The 10pm evening Mass is our Christmas Eve or first Mass in celebration of The Nativity of the Lord. It will be preceded by choral preludes sung by the choir beginning at 9:30pm. As in the past, there will be a second Christmas Mass at 10am on Christmas Day, December 25. We’re decorating for Christmas this week! ~ Next Sunday is not only the Fourth Sunday of Advent, it is also Christmas Eve. We will begin decorating the church this Monday, December 18, at 6:30pm and continue at the same time on Tuesday, December 19, if necessary. Many hands do, indeed, “make light work,” so please help lighten the load for all of us by joining the decorating team. Enter through the side door near the wheelchair ramp. to live within your courts for all our days. Your roads have led us, Lord, ‘cross desert sand. We place our hopes and dreams within your hand. Upon our darkness, Lord, a light has shown. You chose to dwell with us in flesh and bone. you brought us here to see your love’s display. then may our eyes behold your Holy One. so great our hunger, Lord, to see your light. The sparrow finds her home beneath your wing. So may we come to rest where angels sing. Preparation continues this Tuesday evening in the choir loft at 7:00 p.m. – please join us! The Giving Tree ~ Your first week response to the Giving Tree for Gerard Place and St. Luke’s Mission of Mercy was very heartwarming and gives us hope that all the envelopes will have been claimed by this weekend. Please remember to place you cash donation (or check payable to “Blessed Trinity) in the same envelope and drop it in the collection basket by Sunday, December 24. 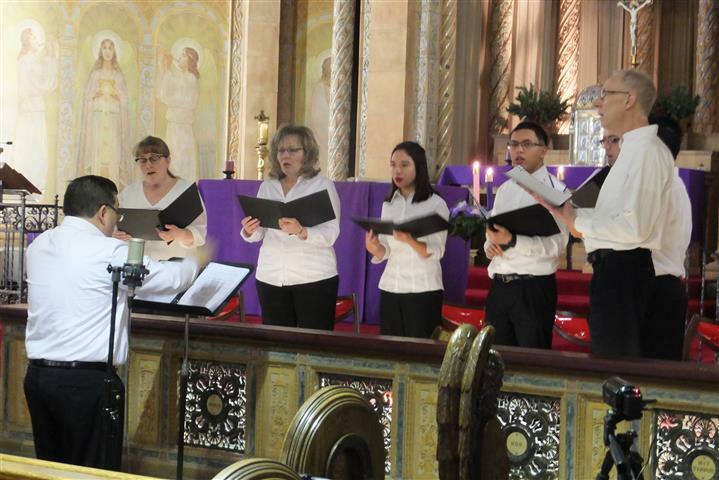 Lessons and Carols at Blessed Trinity ~ We extend our prayerful thanks to Steve Quebral and the members of the Saint John Paul II Schola Cantorum, who presented the beautiful Advent Service of Nine Lessons and Carols at our church on Sunday, December 17. This traditional English service, which dates back almost 100 years, celebrates the birth of Jesus by telling the story of the fall of humanity, the promise of the Messiah, and the birth of Jesus in a series of short Bible readings interspersed with a cappella choral music and congregational singing. We thank everyone who attended, especially the members of our own congregation who served as greeters and readers. 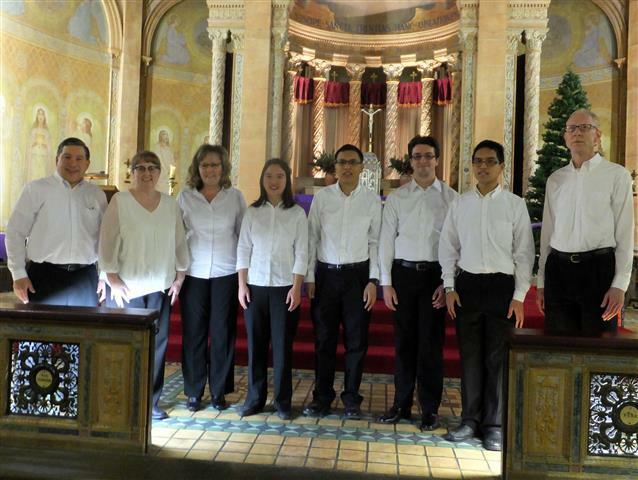 If you would like to hear more of this talented group, they will be performing a concert on December 31 at All Saints Church, 127 Chadduck Avenue, Buffalo. Prisoner Gifts 2017: Continuing Sr. Karen Klimczak’s message of hope to the imprisoned, “Though separated, they are not forgotten.” On Friday, December 8, volunteers representing churches, schools, social agencies, and friends unpacked, sorted and counted supplies for 2,120 gift bags destined for the women at Albion Correctional Facility and the men at Wende. Each bag contained 2 books, ramen noodles, a pair of socks, a granola bar, a bag of candy, 2 packages of hot chocolate, and a note of peace and encouragement. Paint of WNY generously donated their truck and employees on Tuesday to help load the boxes of gift bags and deliver to the prisons on that snowy day. A Big Thank You is extended to all at Blessed Trinity who donated books, hot chocolate or money (a total of $283 was collected with $63 extra used to fill shortages). Thank you to those who decorated over 400 gift bags and to those who helped package the gifts. Thanks to Judy Casassa for recycling all the cardboard boxes and for handling set-up arrangements. Thanks and appreciation to our maintenance man, Dennis, for being at the door to meet deliveries. The help of parishioners who stayed late to clean up was also greatly appreciated. A special thanks and acknowledgement to Coordinator Jan Burns for her hard work bringing this project to another successful conclusion. Hopefully we have left fingerprints of peace. The Ladies Sodality would like to “give credit where credit is due.” Because of the generosity of our parishioners, the 2017 Christmas gift drive for the homebound produced amazing results. A very special “thank you” to the volunteers who delivered poinsettias and gift bags and visited with homebound parishioners and those in senior care facilities. We would appreciate feedback about your experience. 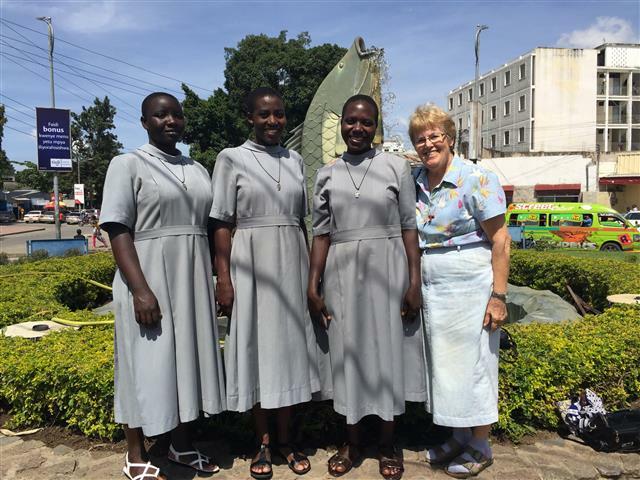 Greetings from Tanzania ~ Our CCCB parishes have received an email greeting from Sister Maureen Harris, who is almost at the mid point of her six-month mission trip to Tanzania, Africa. She attached a photo (posted below) from her trip to the city of Butimba, where she introduced the novices from her religious order to pizza — with mixed results. Christmas Flower Donations ~ The envelopes containing your donations will be placed on the altar during the Christmas season. The persons named on the envelopes will be remembered at all of our Masses. Thank you for your generous donations. “Stories for Christmas” will air on Sunday, December 17 at 1pm and Monday, December 25 at 11pm on WKBW-TV Channel 7…featuring uplifting local stories. Struggling to make ends meet and still put food on the table? We can help. Catholic Charities is the provider of the Women, Infants and Children (WIC) federal nutrition program provides nutrition education and counseling, breastfeeding support, prenatal and postpartum support, referrals and supplemental food vouchers for all kinds of families with children under 5 years old. Services are free of charge. Call 716-218-1484 or visit ccwny.org/wic.